For more information convince me that you’re serious and the best person in the world to take on and continue the blog that posts news and reviews about dogs and dog books. Contact me at don [dot] editor [at] gmail.com. Here’s your chance to see, and enjoy, some canine art by the hands of Nepalese painters. Publisher’s synopsis: Dawa looks like just another scruffy Thimphu street dog, but don’t be fooled: he understands Dzong­kha, he has an urge to see the world and his bigger-than-normal brain is matched only by his compassionate heart. His is an extra­ordinary life; follow its tragic beginnings to his ascen­sions as the Legendary Leader of Howling in Thimphu, to the miracle that saves him. Dawa’s story will appeal to all who have experi­enced life’s rigors – but have never given up hope on the possi­bilities. The book was first published in 2004; now republished in a special 10th anniversary edition, 2014, from http://www.Riyangbooks.com. Early in the book it is clear that Dawa has unusual powers — of common sense, of right and wrong, and of a certain level of canine authority. He can understand human language (Dzongkha, the main language of Bhutan). And, of course, like the human elites around him, he has to learn the honorific form of the language so that he can understand and perform appropriately in his adopted social milieu. And, he feels com­pelled to invent a prestigious pedigree, a sign of high status. The one he comes up with links him directly to one of the noble lineages of Lhasa, Tibet. And at one point she writes even more openly that Dawa “was often amused by the analogies humans made to dogs,” much as she, with writer’s license, is amused by those very humans Dawa’s life appears to mirror. This enjoyable little book is both written and was first published in 2004 by an established Bhutan­ese writer, recently reissued in a limited edition dated 2014 by Riyangbooks.com. Kunzang Choden’s books (below) are available in North American from Amazon.com, in Europe from Amazon.co.uk, and in South Asia from Amazon.co.in. Ogyen Choling: A Manor in Central Bhutan. Edited by: Kunzang Choden and Dolma C. Roder. Designed by: Riyang Books. Synopsis: Perched on the outcrop of a mountain, the Ogyen Choling manor overlooks the picturesque and secluded Tang valley in Bumthang, Central Bhutan. The same family, now in its 20th generation, has had possession of the manor since the 15th Century. Once the home of the religious nobility of the region, the manor has stood witness to a changing nation. Most significantly the social reforms of the 1950s saw the family yield considerable political and economic power. Ogyen Choling has not only survived these changes but has adapted to these new realities to create a niche for itself as an important site of cultural heritage. Ogyen Choling’s architectural significance, its connection to a fading pre-democratic past and its continued religious relevance makes it the ideal site for the museum which opened to the public in 2001. In this book Françoise Pommaret locates Ogyen Choling in the regional historical context, while Pierre Pichard, provides rich details about the manor’s traditional architecture and the members of the Ogyen Choling family share their memories of growing up and living here. Membar Tsho – The Flaming Lake. By: Kunzang Choden. Illustrations by: Pema Tshering. Synopsis: Membar Tsho- The Flaming Lake brings the story of Terton Pema Lingpa to our children in poetic verses with vivid illustrations. The book is the first of its kind to introduce the important figure of Pema Lingpa, the cultural concepts of tertons, hidden treasures and hidden lands and the sacred spot of Membar Tsho in Tang, Bumthang. This story by Kunzang Choden, who is also from Tang, Bumthang describes in an emotive narration, Pema Lingpa’s second act of discovering treasures from Membar Tsho in 1476. Pema Tshering, a founding member of VAST-Bhutan (Voluntary Artist Studio, Thimphu ), enlivens the story through his sensitive artistry with watercolor paintings. Synopsis: Dechen and her mother live in a village in Bhutan. Dechen’s mother wants to teach her to weave, but Dechen is not interested. She finds weaving boring and whines that she will never be able to learn. One day, something changes her mind. The Circle of Karma (2013), Tales in Colour and Other Stories (2015), Bhutanese Tales of the Yeti (2013, by Kunzang Choden, Kunzang Dorji & Karma Wangda), Folktales of Bhutan (1995), Room in Your Heart (2011), Chilli and Cheese: Food and Society in Bhutan (2008), Bhutan: Land of Spirituality and Modeernization / Role of Water in Daily Life (2004, by Dieter Zurcher & Kunzang Choden). In this cozy murder mystery, the plot revolves around the death of a young man, a diabetic named Chester Willis, age 41. The medical examiner lists it as a “probable suicide” from an overdose of insulin. But Dr. Lucy Ingram has her doubts. She had recently treated Chester for an unrelated accident, and having talked with him and observed him carefully, she feels that he was highly unlikely to commit suicide. “No matter what, Chester Willis wouldn’t kill himself,” she said aloud, shaking her head. With that commitment, the plot is off and running. After Dr. Ingram convinces the medical examiner to do a second autopsy, he finds an injection site on Chester’s toe, from which it is apparent that someone deliberately killed him. Throughout the book’s 43 short chapters we follow four main characters trying to solve the homicide. Two characters are officially investigating the case – Sheriff Ben Bradley and Chief Detective Wayne Nichols. Dr. Ingram MD is also committed, having set the investigation in motion. There’s also Mae December, the Sheriff’s girlfriend. She boards, trains, and breeds dogs, and maintains an on and off presence in the background, along with her four canines: two Welsh corgis, a black pug, and the newest member of the canine menagerie, a basset hound puppy named Cupcake who was a birthday present for the sheriff’s young son, Matt. Several other characters also figure in the story, including a newly appointed investigator named Dory and other members of the Sheriff’s staff. On the other side of the plot is Willis Senior, Chester’s father, who dies of heart failure within days of Chester’s murder, and whose will and the allocation of his sizeable wealth, suggests a motive for Chester’s death. One of the prime suspects in the murder is Rick Willis, Chester’s older brother who, along with his girlfriend Meredith, has debts to pay and acts suspiciously. And, not least, there’s a financially struggling young massage therapist name Brooke to whom Willis Senior had recently decided to bequeath his deceased wife’s jewelry. There are many threads to this mystery, many characters to keep track of (though the author does a good job of guiding us along), many clues and leads to follow, and many loose ends, all the way to an interesting conclusion. The end of the story is one that some clever and attentive readers may puzzle out well before the last page, but probably not. 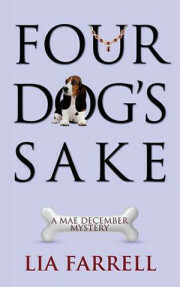 Four Dog’s Sake is the fourth in the Mae December mystery series, after One Dogs Too Many, Two Dogs Lie Sleeping, and Three Dog Day. But the dogs in Four Dog’s Sake seem to be too deep in the background to be heralded in the book’s title, and some readers (looking for a good dog story) will come away disappointed. They simply play two small a role, though we have to laugh when the basset hound pup keeps stepping on his exceedingly long, floppy ears. Despite the minor role that dogs play in the story, Four Dog’s Sake is a good, easy read, of an evening or two, while sitting with your own favorite dog by your feet. P.S. The author, Lia Farrell is a mother-daughter team, consisting of Lyn Farquhar and Lisa Fitzsimmons, both of whom know how to write mystery novels, dogs and all. In this book for 8- to 12-year-old kids, Jimmy lives in a world where his mom is away at work every day, his father is always off job-hunting, his bossy older sister gives him fits, and at least one of the baby-sitters he has to cope with is a bit weird. What Jimmy wants is a dog to befriend, to keep him company, and to relate to. For a long while, it’s not on. Then, one afternoon, his father tell him it is time, and Jimmy (who narrates the whole story) tells us how he got a strange little dog called Abby – how it all started, that is. It was love at first sight, and when they left the animal shelter they took that awesome critter home, and named him Abby. And it is soon clear that Abby is not only scruffy and awesome, but over-the-top bright. 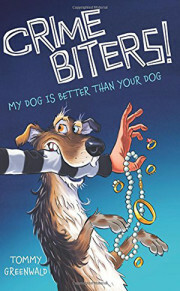 What’s really good about this book is how the boy and the dog bond, and what they teach each other about life, and how the overly smart mutt solves a seriously strange mystery. Along the way, various facts of wisdom and common sense for growing are embedded in the story. For example, after they had visited the animal shelter ‒ FACT: If you consider yourself not that popular of a person, go to an animal shelter. You will feel really popular, really fast. And, after having eaten something vile that a concerned baby-sitter fixed for Jimmy ‒ FACT: Nothing good for you tastes good. Everybody knows that. Whatever she served him tasted vile, and no matter how hard Jimmy tried to get the taste of it out of his mouth ‒ FACT: Toothpaste is no match for garlic and kelp. This is the sort of book, written for pre-teens, that is recommended for the boy who shows little interest in reading. Once he gets into this story, he’ll likely be hooked on books for life. It’s a good read.